Already last year, the Huber brothers had wanted to tackle the North Face of Latok I. “The project has already been tried many times by really good climbers. But so far, the wall has resisted vehemently”, Alexander told me then. “We need a lot of luck to be successful. But my goodness, if you do not try you can not make it.” Just before the scheduled departure the climbers called off the expedition due to the uncertain situation in Pakistan. Not canceled, only postponed. Yesterday the team of the Huber brothers left Skardu in Baltistan heading for Latok I, where they are expected to arrive today or tomorrow. The team includes the Austrian cameraman Seppi Dabringer and two more climbers: the 37-year-old Mario Walder from Austria and the 31-year-old Dani Arnold from Switzerland. Mario has already been on expedition with the Huber brothers several times. 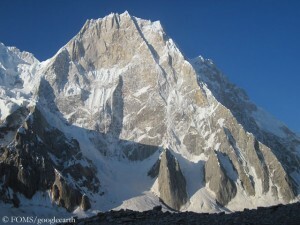 In 2009 they succeeded in free climbing the legendary route “Eternal Flame” on the 6251-meter-high Nameless Tower in the Karakoram, doing it for the first time redpoint, means in one push without fall. Dani has recently made headlines in particular with his speed records on Matterhorn and Eiger in Switzerland. 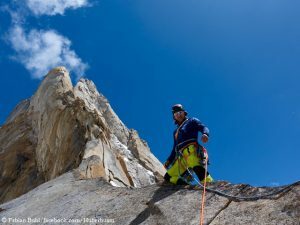 In 2013 he made the third winter ascent of the legendary 3128-meter-high Cerro Torre in Patagonia, along with Thomas Huber (and Stephan Siegrist and Matias Villavicencio). Thus it is really a strong team that will try to climb the North Face of Latok I. Their next coup on Choktoi Glacier? 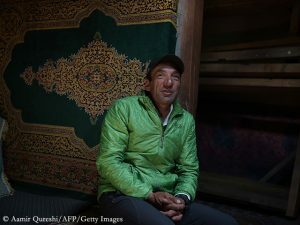 The 48-year-old Thomas and the 46-year-old Alexander Huber have pitched their tents on the Choktoi Glacier several times during their long climbing career. So in 1997, when they succeeded in first climbing the 2.000-meter-high West Face of Latok II (along with their compatriot Toni Gutsch and the American Conrad Anker) – a milestone in big wall climbing. In 2001, Thomas (and the Swiss Urs Stoecker and Iwan Wolf) made the second ascent of the extremely challenging 7285-meter-high Ogre, a neighboring peak of the Latoks. All Ogre expeditions before had failed since the first ascent by the British climbing legends Chris Bonington and Doug Scott in 1977. Maybe the next coup of the “Huberbuam” in this area will follow this summer: on the North Face of Latok I.